Leslie Supnet is a Winnipeg-based artist who works in a variety of media, including drawing and animation. A few days ago, I noticed a tiny version of the drawing below posted on another website as an avatar. I asked if it related to circuit bending, which I know is another one of Leslie’s creative interests. Much more interestingly, this piece is called “Working Overtime” and, through conversation, I learned that it was something Leslie penned while developing an image to accompany an article about child labour in Québec. Reflecting on what could be the worst possible thing to work on while working overtime, it occurred to her that fixing a punch clock in order to punch out of work, would definitely count. Not only is this character’s overtime effort not being recorded, but he must also fix the clock quickly enough to go home, thereby minimizing the amount of time he is being exploited. That’s all kinds of undesirable pressure! Leslie informed me that she wanted to make a statement about time and work, and in addition, how time is critical to understanding and coming to terms with the nature of work. 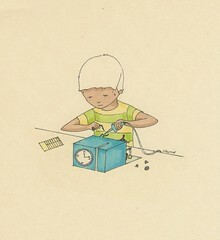 Leslie Supnet, Working Overtime, Ink on paper, 2008. Thanks for sending this along, Monika! Only one in six workers takes a regular lunch break, says new research. And one consequence of the credit crunch is that breaks are getting even shorter as job insecurity increases. Are you reading this article while eating a sandwich at your desk? If so, you are not alone. Research by human resources firm Chiumento has found that only 16% of employees regularly take a “proper” lunch break. By that, they mean about an hour’s break away from their desk at least three times a week. Andrew Hill, who helped conduct the study, says the British are deserting the lunch break in increasing numbers. “Employees are struggling to keep on top of to-do lists and think the answer is to work harder, eating a sandwich at their desk as opposed to taking a full lunch break, and also not having sufficient breaks during the rest of the day. A lunch break, he says, achieves three things: it helps the mind and body recharge; it enables people to step back and focus on what’s important; and it makes them feel valued by their employer. And – just like after a sleep – solutions that seemed out of reach to a tired mind can suddenly surface to a refreshed one. Research a few years ago put the average lunch break at 27 minutes and Cary Cooper, occupational psychologist at Lancaster University, says that in the current economic climate it’s getting even shorter. “The vast majority of people are having lunch at their desk while working. That’s the average person now. Very rarely do they get out of the office. It’s important to take breaks with colleagues – sitting in the park or outside a pub, going out to buy sandwiches – because good social relationships lead to good working relationships, he says. “People feel they have to get to work early, stay late and not take lunch breaks and I think it’s going to get worse because of job insecurity. People will want to show more commitment and that means working through their lunch and staying late. In the 1970s the British were the laziest men of Europe. Now they are considered the workaholics of Europe, thanks to an adoption of the American work ethic in the mid-80s, says Professor Cooper. But tellingly, productivity per capita in the UK remains lower than many of its European neighbours. In many cases it is out of the hands of employees to wander off for an hour, because their firms only allow a maximum of 30 minutes for lunch. But Peter Clayton, 42, who works in human resources at pharmaceutical firm AstraZeneca, spends three or four lunchtimes a week running, for between 30 and 80 minutes. It helps that his firm has a running club and a flexible working environment, which means he can put on his trainers between meetings. And there is the added incentive – not shared by every workplace – of having the beautiful Cheshire countryside, including Alderley Edge, on the doorstep. Kusnet, David. Love the Work, Hate the Job: Why America’s Best Workers Are Unhappier Than Ever. Wiley, 2008. Why are so many of America’s most educated, skilled, and committed workers angrier than ever? 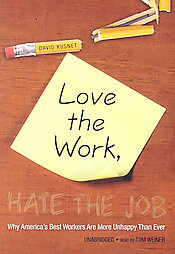 In Love the Work, Hate the Job, author David Kusnet follows workers through four conflicts in the trailblazing city of Seattle. 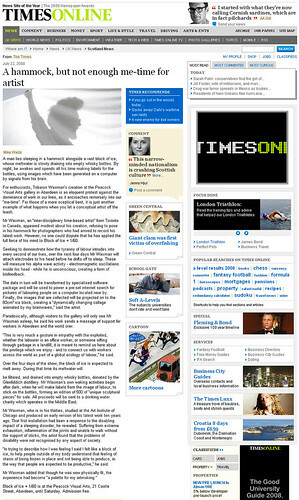 At Boeing, aircraft engineers and technicians conducted the longest and largest strike by professionals in private industry in U.S. history, but their picket signs said they were “On Strike for Boeing.” At Microsoft, thousands of workers holding short-term positions founded their own Web site to protest being “perma-temps.” Still, they were almost as upset about their problems testing software as they were about their own precarious prospects. At a local hospital, workers complained that patient care was getting short shrift and organized with the nation’s fastest-growing union. And at Kaiser Aluminum, during a labor-manage-ment conflict that dragged on for two years, workers allied themselves with environmentalists to fight cutthroat corporate tactics. Coming in the aftermath of the mass protests at the World Trade Organization meeting in Seattle in 1999, these conflicts point out the paradox of globalization. U.S. companies can compete most successfully by improving quality instead of just cutting costs. But penny-pinching practices can prevent their best workers from doing their best work, fueling workplace conflicts and depriving businesses of their single greatest advantage. With powerful storytelling, revealing detail, and compelling analysis, Love the Work, Hate the Job offers provocative insights into today’s workplaces, tomorrow’s headlines, and Americans’ too-often thwarted aspirations to do their jobs better. Bell, Daniel. 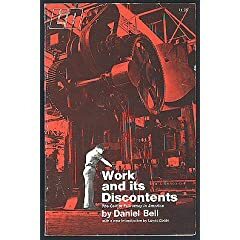 Work and Its Discontents. Beacon Press, 1956.